...learn details about Vermeer himself. Buy Chevalier's novel or DVD "Girl with a Pearl Earring"
Special thanks to Sandra Forty and TAJ books for permission to use some of Sandra's thoughts about Johannes Vermeer's paintings with pearls in them. You'll love this book....it's gorgeous. Johannes Vermeer's---that now famous painter--birthplace and growing up place was in Delft, Holland, (Netherlands), in the 17th century, when it had a population of 20,000 people. Delft is still today well know for it's delft terra cota tiles and blue delft pottery and delft porcelain. Being surrounded by such creative artistry undoubtedly would inspire any young man with creative tendencies. The earliest record of Johannes was on October 31, 1632 when his parents, Diguer Balthasars and Reynier Jansy. Vos. brought him for baptism to the Dutch Reformed Church at Neuwe Kerk in Delt. Jan father worked in the silk trade as weaver producing "caffa" a fine silken fabric. Surely, another reason that young man had an artistic bent...he lived with an artisan father, who, by the way, also as a sideline was an art dealer and valuer. In 1641 he purchased "Mechelm" Inn situated in Grote Market of Delft. Jan, the artist, was an apprentice painter in Delft about 1667. He wasn't alone in his trade...there were some 1,000 painters working in Delft at this time. No wonder it took so long to discover this fellow. On December 29, 1653, painter Vermere was registered as a master painter of the Delft Painter's Guild of St. Luke. April 20 of the same year, 1653, he was married to Catharina Bolner, a girl from a Catholic family. She married Johannes Vermeer against the wishes of her Catholic mother who wanted Johannes to convert to Catholism. The newly weds lived with Catharina's family on Oude Langendijck in "Papisti Corner" of Delft. Together they had 11 children....the merry olden days when children were truly seen as the blessings they are. 1662-63 and 1669-70 Jan Vermeer served as the headman of the Painter's Guild...but didn't sell many of his own paintings. After his father's death, Jan took over "Mechelm Inn" and ran his father's art and dealer shop. Jan died in 1675 at the age of 43, sadly, in debt. For 200 years Jan remained in obscurity until "discovered" by a Frenchman named Etrenue Thore (1807-1869). He used the nom de plume of William Burger. He managed to find and authenticate several of his paintings and from there on his fame rose...even to the point of books and now movies bearing his name. Of course, so far, his most famous painting is the Girl with the Pearl Earring. "And, of course, that famous pearl earring...to own such a pearl her husband or father had to be wealthy." Mikimoto's cultured pearls would be nothing in comparison with two huge matching natural pearls of such elegance. Or was there a matching pearl earring? The title suggests the opposite...earring... singular. Maybe there's another story here waiting to be told...what happened to the matching earring? Was it sold to pay bills? Lost? Read here about a pearl earring which Cleopatra owned and consumed to show forth her power of wealth to Anthony. Again, it wasn't the single pearl that alone brought the expense, but the matched set, quadrupling the price of a single huge pearl. It's well believed and accepted that Jan Vermeer used pearls to symbolize and illustrate PURITY. This puts to question whether or not Jan would be pleased with modern interpretations of his painting put into the current popular books and movies. Some have suggested that the girl with the pearl earring is his own daughter, but the date allows his oldest daughter, Marie to be only 11 at the time of the painting. What do you think? I personally have seen some very mature looking 11-year-olds...and personally think it quite possible. Maybe it was a borrowed earring, or that of a grandmother's, or even on loan from a jeweler friend. We will never know, but can only enjoy this marvelous painting with its many unanswered questions. Sandra Forty has this to say about this second painting of featuring pearls. "Beautiful study of sumptuously dressed young woman admiring herself and her pearls in a mirror is painting masterclass..
"Jan Vermeer uses his oil paints to perfection; the subject's ermine furs and silken look is vibrant as any artist could achieve, and use of light and space gives the painting a unique tension and reality. "She is ready to go out and socialize; her face, hair, and clothes are perfect and she looks completely satisfied with her presentation. "The light and dark contrast strongly against each other with prominent light illuminating the upper half of the painting and little obvious detail emerging in the darkened parts of the room to distract attention from the woman. "Pearls were significant for Jan and they signify purity, there is little to suggest that this woman is anything other than she seems. "Although this is one of Johannes Vermeer most famous paintings, the earliest record of it's provenance is from an obscure sale in 1880 when it was bought for very little." Once again...little can be improved on Linda Forty's observations, so with permission, I quote her here. "This subject is undoubtedly allegorical in meaning. The woman stands in darkness except for the chink of light creeping in around the curtain edge that bathes her face in radiance. "The instant impressions is that the painting is a study of a lady weighing her jewels--Amsterdam, Netherlands, has long held a reputation and been a world center for the jewelry trade, especially diamonds." But pearls also appear obvious in the painting. "In front of her lie an impressive selection of jewels and she certainly looks content with her belongings. "Partially the sun behind her on the wall is a painting of the "Last Judgment" when souls are weighed for their worth. "The painting is significant and Vermeer may be indicating that worldly wealth counts for nothing at St. Peter's gate. "A mirror glints on the wall in front of the woman so she can watch for her own reflection as she awaits her destiny. "She looks calm and consoling, content, to let the balance decide for her. "Upon close scrutiny it becomes clear that the scales she is holding are actually empty so she appears to be weighing options--does she chose worldly wealth as shown by her jewels or the spiritual wealth of the Christian life?" It certainly must have been something that Vermeer himself was considering and something that he wanted the rest of the world to ponder as it enjoyed his painting. 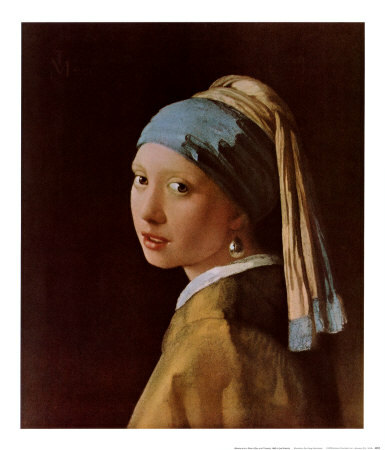 Thanks to Linda Forty for her insightful thoughts and comments on Vermeer. Her new book is absolutely lovely...many large photos....you won't want to miss out on seeing it or owning it. Go to Homepage for Karipearls after Vermeer.